Waxwings are well known as irruptive winter visitors to the UK. They breed in the remote northern pine forests of Scandinavia and Russia. In autumn and winter they feed on berries and it is the relative abundance of these that determines how far the birds have to travel to find food. Variable berry crops from year to year result in varying numbers arriving in the UK. Their striking plumage, distinctive "trilling" call and confiding nature when feeding on berries in towns and cities makes watching them an experience never to be forgotten. Numbers and arrival dates in the UK vary considerably from winter to winter. In some winters few birds arrive, while in others several thousand are recorded. We seldom get irruptions in consecutive winters. The vagaries of Waxwing migration are well illustrated by two contrasting ringing movements described below. 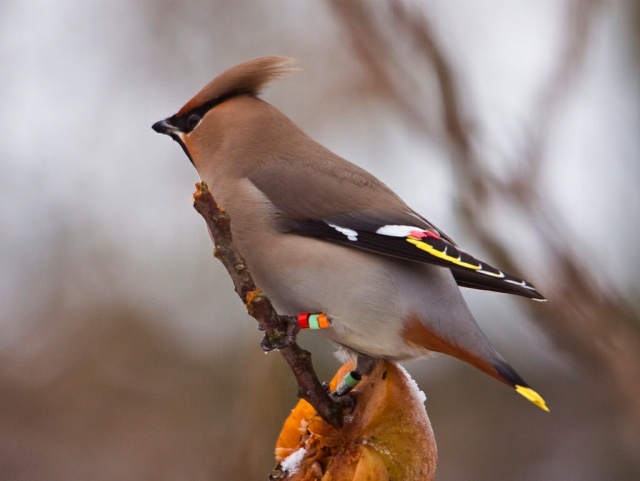 Aberdeen can be regarded as the UK's capital city of Waxwings. Its location in relation to southwest Norway means that if there is any sort of influx from Scandinavia Aberdeen usually gets some birds. The abundance and variety of berries in the city attracts and holds birds and in the larger invasions flocks of over 1000 birds have been recorded. Grampian Ringing Group have been colour-ringing Waxwings in and around Aberdeen since 1988. Thanks to many birders/photographers and members of the public providing resightings and recoveries of dead birds, the results have produced an interesting picture of the birds southwards movements through the UK after landfall in northeast Scotland (see The Migration Atlas, Wernham et al. 2002). Unfortunately, once the Waxwings depart to their remote summer breeding grounds few are ever heard of again. So when small numbers started to arrive in the UK in February 2010, it was an exciting surprise to have a colour-ringed bird return to the same village in which it had been ringed the previous February. It had been colour-ringed almost a year to the day (right leg: light green over metal, left leg: orange over light green over red) as an immature female on 18/02/09 in an orchard in Kintore 500 metres down the road from Walter and Ann's garden. This is only the third confirmed record of a Waxwing returning to the UK in a subsequent winter from over 4,500 ringed birds. In contrast is a bird ringed as an adult male in Aberdeen on 31/03/05, during the very large invasion of winter 2004/05. It was killed by a cat the following February, on 15/02/06, in Alyabevskiy, Sovetskiy, Khanty-Mansi, Russian Federation (61º17'N, 62º47'E), a village east of the Ural Mountain range and north of Kazakhstan, 3714 km northeast of its ringing location the previous winter...and closer to Mongolia than Aberdeen! 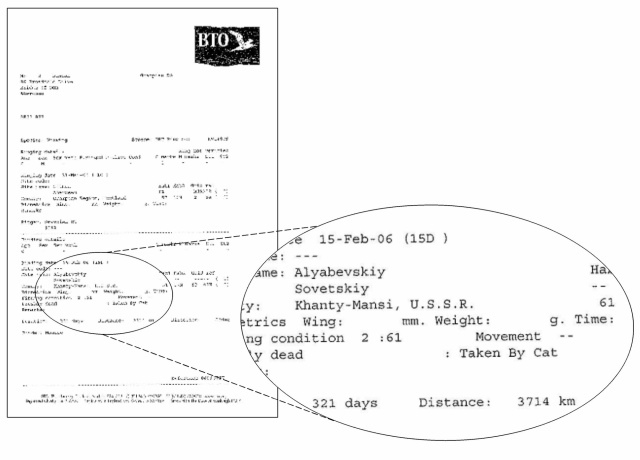 The recovery slip from the BTO showing the details of the Waxwing ringed in Aberdeen in March 2005 and killed by a cat in Russia the following February.